The N1207 flexible LED neon lights from Surmountor Lighting provide classic lighting effect of neon glass tubes with enhanced durability, flexibility, reliability and energy efficiency delivered by LED technology. The high density neon flex light incorporates 300 LEDs per meter which provides seamless illumination over its entire length with no bright light spots. The monochromatic SMD LEDs are mounted onto a high ductility flexible PCB which is fully encapsulated by a silicone extrusion which protects the light from dust ingress and provides watertight integrity. The durable LED neon rope is resistant to impact, stress and vibration, eliminating breakage that can be associated with fragile neon glass. The flexible waterproof lighting systems offers an exceptionally versatile solution for a plethora of creative lighting applications, including but not limited to accent lighting, architectural lighting, decorative lighting, and signage lighting. The N1207 series LED neon lights use SMD2014 LED packages which come with solder pads with enhanced solderability. The integrity and the reliability of solder joints are critical in preventing electrical and physical breaks in the flexible circuits which are often used in installations that require bending or twist of the PCB. High performance solder joints establish a reliable electrical contact and provide optimum thermal performance. The flexible PCB is made of high fatigue resistance copper which offers excellent bending stability. The white LEDs are tightly binned to deliver chromaticity consistency to minimize LED-to-LED variation within a light and product-to-product variation within an installation. With a phosphor coating that provide high luminescent efficiency, color rendering and chromaticity stability, the light sources deliver high quality light in a warm, neutral or cool white CCT with superior lumen maintenance and minimal color shift. A guaranteed chromaticity tolerance of ±100K ensures significantly improved color stability over competitor's products. The N1207 flexible LED neon lights produce up to 1300 lumens per meter. The light runs on 24-volt DC power supply and draw 19.2 watts per meter. Maximum run length is 50 meters and can be cut to size in 20mm intervals. 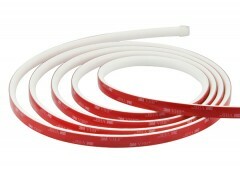 Surmountor's proprietary silicone sleeving technology not only addresses the lifetime reliability of ingress protection, but also takes account of the color shift caused by the sealants over LEDs. Compared with PVC, PU and TPU which are commonly used in waterproof protection of LED neon strips, silicone has superior flexibility, malleability and temperature resistance. Optical-grade silicone offers high transmission across a broad spectrum. The chemically inert have no yellow cast over time. These properties makes silicone sleeved LED neon lights an all-weather solution in a wide variation of temperature conditions. Uniform glow over its entire length. High ductility and solderability PCB board. SMD2014 LEDs with excellent color stability and luminous efficacy. Cuttable every 20mm or in segments of 6 LED nodes. Operates on 24 volts DC power supply. Milky or frosted silicone extrusion. 3M thermal conductive adhesive backing. 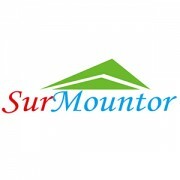 Other Products from Shenzhen Surmountor Lighting Co., Ltd.